On average, there is an 18+ day wait to see a primary care doctor in the U.S. Are your employees getting the care they need? When employees are unable to see their doctor, they often end up in urgent care or the ER for basic care needs. These preventable visits have a larger impact on overall healthcare costs than employers may realize. Which care experience drives an impact? We compare the virtual doctor, the on-site company doctor, and the neighborhood doctor to see how each stacks up. One size does not fit all: Find the best approach for your employee population. There are pros and cons to each approach - we outline the right questions to ask when choosing the best healthcare access solution for your organization. Employees are overusing ER and urgent care for basic needs because they can’t easily access their primary care doctor. Read our report to learn how to improve your employees’ care experience. We’ll show you how to get them the care they need, when they need it, while lowering your overall health care costs. More than 1,000 companies rely on One Medical to give their employees unparalleled access to near-site primary care, 24/7 telemedicine and on-site care. 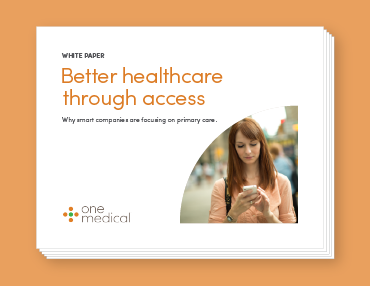 One Medical’s in-network approach helps companies reduce costly visits to the ER, urgent care, and specialists, enabling them to decrease their health care costs by an average of 5%. Copyright ©2016 1Life Healthcare, Inc. All rights reserved.